I was looking to set the vMotion priority to make critical VMs like linux cluster VMs to move quicker than the other VMs ,tried the timeout value to max in linux OS level for cluster but still when the vMotion is taking extra timeout , one of the cluster node is considering the other node as down and it initiates the VM reboot, which causes downtime for the application and to overcome that I found from the Brian Graf blog the below option called vMotion Priority .. When a vMotion occurs, vCenter attempts to reserve the resources on both the source and destination hosts to be shared among all concurrent migrations. For vMotions set at High Priority, vCenter will give a greater share of host CPU resources over the Standard Priority vMotion. This is useful if there is a need to push a specific virtual machine through vMotion quicker than other VMs that are being vMotion at the same time. The –vMotionPriority parameter is added on to the Move-VM cmdlet as seen below. *Note: vMotion Priority is a benefit realized during concurrent vMotions. Tested in my lab and the reference is from the Brian Graf blog . 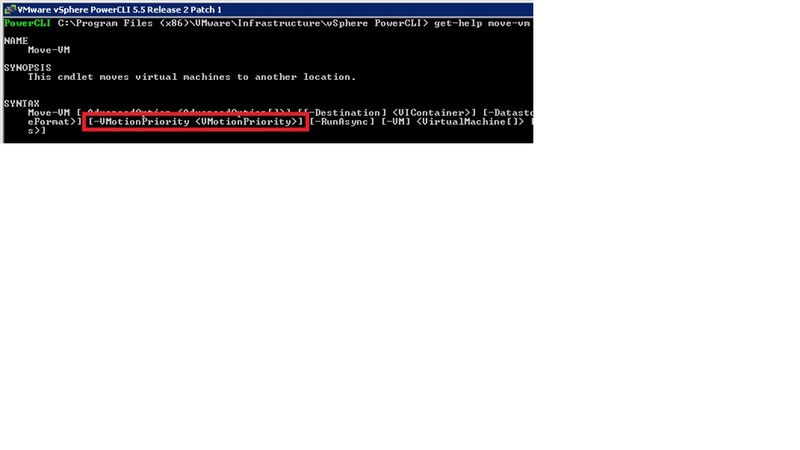 This entry was posted in PowerCLI, VMware and tagged performance, PowerCLI, vMotion. Bookmark the permalink.